Sterling has been innovating and creating the finest rope products since 1992. Their current rope line is a diverse mix of products, each thoughtfully designed to meet the needs of the user and meticulously manufactured to the highest quality standards. Swift water, ice and flooded environments present difficult challenges for rescue personnel. 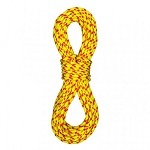 Sterling ropes perform in these harsh conditions with strength and optimal flotation. They manufacture throwlines and water rescue ropes with the same precision and quality that they do with all of their life safety ropes. Sterling developed these ropes using only the best quality and highest tenacity polypropylene, nylon and Spectra ® fibers. A “tread-like” sheath pattern gives both rescuer and victim extra gripping power while also providing buoyancy. 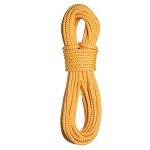 The nylon core adds strength and keeps the rope flexible for throw bag storage and deployment. 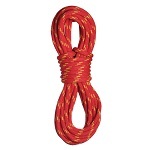 3/8" NFPA certified rope contains a nylon Drycore for strength and minimum moisture absorption. 3282 lbs of breaking strength. Integrates a high strength, braided Spectra core with a polypropylene sheath for superior strength over standard float ropes. Maintains trouble-free handling characteristics and buoyancy. Polypropylene sheath adds buoyancy and protects the high strength, braided Spectra core. 2495 lb. tensile strength. Polypropylene sheath adds buoyancy and protects the high strength, braided Spectra core. 5237 lb. tensile strength. 100% polypropylene for superior buoyancy. Kernmantle construction. 7/16". 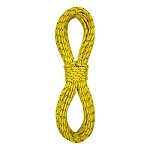 Sterling WaterLine Rescue Rope has 4406 lb. tensile strength.